“The future of video entertainment has arrived with 3D stereo viewing for the home,” said Michael Mauser, president, Lifestyle Division, HARMAN. "Our two new Harman Kardon BDS systems now include 3D video in our ecosystem. The Harman Kardon Remote App's interface matches what you see on the screen, making the remote easy and straightforward to use. And these two home-theater-in-a-box systems are the first in the world that come with MHL support for smartphones and tablets, right out of the box." Harman Kardon's new BDS 3D Blu-ray systems are chock-full of innovations. The MHL input on the back affords control of the Roku Streaming Stick, and pulls your smartphone or tablet into the home theater setup. iOS and Android users alike will appreciate the built-in support for AirPlay and DLNA over Wi-Fi. NFC technology gives the home theater system instant, effortless Bluetooth pairing with mobile devices. These Harman Kardon BDS systems are also the first in the world with Dolby Volume, which automatically balances the volume between loud action scenes and quiet dialog; no more punching the volume remote every two minutes for fear of waking the neighbors or the kids. And tying everything together is the Remote App with its consistent graphical user interface on your mobile device. The sound reproduction lives up to the world-renowned Harman Kardon standards, with features like Dolby TrueHD, Dolby Volume, DTS Digital Surround, Harman Kardon NSP Natural Surround Processing, and EzSet/EQ III auto-calibration that gives more immediacy and realism than ever to any room. 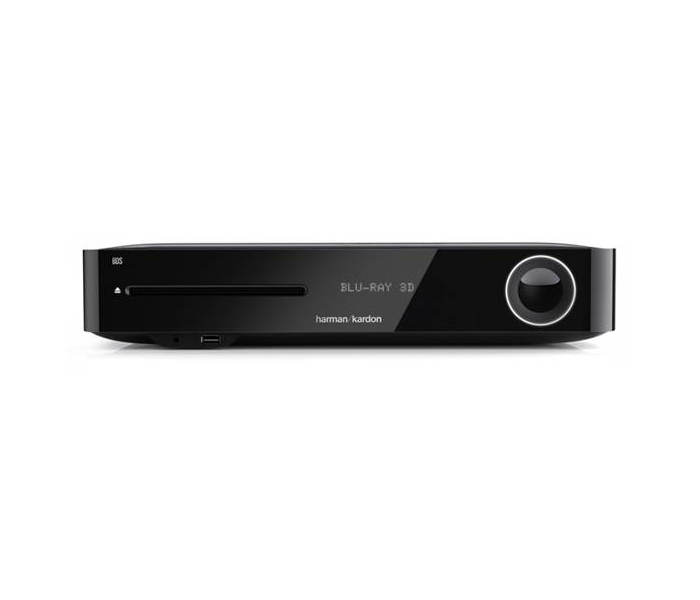 Harman Kardon BDS 580 5.1 Blu-ray System provides outstanding 5.1-channel audio/video performance. It reads all common disc formats, including 3D Blu-ray, selectable NTSC or PAL DVD, and audio CDs. Users can access content through a wide array of wireless formats, including Wireless Bluetooth from your stereo, smartphone or MP3 player. World's first built-in Wi-Fi supports AirPlay for Apple and iOS devices and DLNA 1.5 for Android, Windows, and other Harman Kardon devices. It relies on five, 65-watt-per-channel amplifiers to support 20 Hz to 20 kHz ± 0.5 dB frequency response, with a dedicated subwoofer preamp output channel. Its clean amplification boasts a –90 dB signal-to-noise ratio, and employs Harman Kardon DSP for improved soundstaging and voicing. EzSet/EQ III auto-calibration fine-tunes the sound to your room. Movie soundtrack realism and consistent sound levels are provided by Dolby Digital, Dolby Digital Plus, Dolby TrueHD, DTS Digital decoding and Dolby Volume. The system is available with three HDMI inputs and (one with MHL) or one HDMI output (with ARC). For radio listening, the system includes a full-featured FM tuner with a range of 87.5 MHz to 108.0 MHz (U.S. and EU). It comes ready to access networked services including Picasa, AccuWeather™, and more. A front-facing USB port is convenient for playing MP3s from jump drives, and a rear USB port stands ready to power Google Chromecast. A programmable multi-device remote control, plus the Harman Kardon Remote app for iOS and Android devices complete the package. Harman Kardon BDS 280 2.1 Blu-ray System reads 3D Blu-ray, NTSC/PAL DVD, and CD disc formats, and can stream from your stereo, smartphone, tablet or MP3 player using Bluetooth or Wi-Fi-enabled AirPlay (for Apple and iOS devices) and DLNA 1.5 for Android, Windows and other Harman Kardon devices. HARMAN TrueStream automatically chooses the best connection method for any tablet, smartphone or laptop, and assistance from NFC makes Bluetooth setup as easy as pushing a button. Two, 65-watt-per-channel amplifiers and a dedicated subwoofer preamp port support 20 Hz to 20 kHz ± 0.5 dB frequency response at a signal-to-noise ratio of –90 dB. Harman Kardon Digital Signal Processing enhances soundstaging and voicing, with EzSet/EQ III auto-calibration to help fine-tune the sound to your room. Dolby Volume keeps the sound balanced and true while keeping the volume consistent and manageable, while Dolby TrueHD and DTS Digital Surround get the most bang per buck from movie soundtracks. Breakthrough Harman Virtual Surround creates a virtual 5.1 surround experience from just 2 speakers. The system is available with a choice of three HDMI inputs and (one with MHL) or one HDMI output (with ARC). For radio, The BDS 280 comes with a full-featured FM tuner with a frequency range of 87.5 MHz to 108.0 MHz (U.S. and EU). The system arrives ready to receive networked services including Picasa, AccuWeather™ and more. A front-facing USB port is convenient for playing from USB jump drives and memory sticks, and a rear-facing USB port provides power for Google Chromecast. A programmable multi-device remote control and the Harman Kardon Remote app for iOS and Android devices make it couch-ready. For additional information on the Harman Kardon BDS 580 (MSRP $1,099) or Harman Kardon BDS 280 (MSRP $510) 3D Blu-ray Systems, or to purchase, visit www.harmankardon.com.